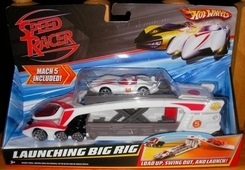 This road-ruling 10-inch big rig delivers double-action fun, transporting the champion Mach 5 and acting as a cool car launcher too. Drive the Mach 5 up the ramp to the top level and drive it around town. Then, move it down to the lower level, and launch it out to start racing. It connects to Hot Wheels track sets, too! Carry it around wherever you go; you never know when you'll be challenged to a race! Not for use with some Hot Wheels vehicles.